Well, not quite the moon but definitely headed in that direction. 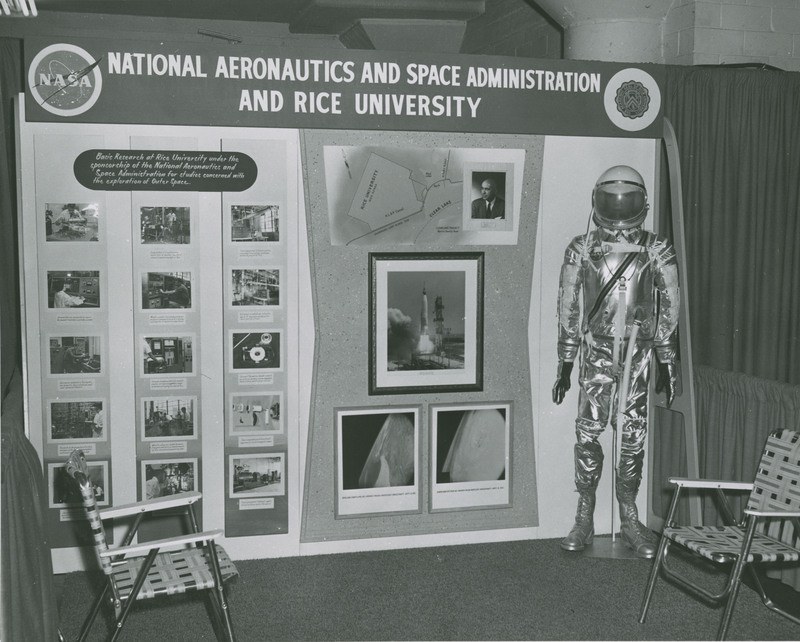 Almost the next thing I saw was this very unusual picture labeled “Space Science Department Display.” There isn’t a date or any other identifying notes and I have no good idea of where it was taken, although it seems to be at an exhibition of some sort. There’s a lot to see here, though, starting with the flight suit and the lawn chairs. Zoom in for the really good stuff–the map (labeled “Clear Lake Project”) is clear enough to read and it shows Rice as the owner of the land that became the site of the Manned Space Center. The rocket underneath the map seems to be a Mercury rocket, but otherwise there are a lot of mysteries here–what’s going on in all those pictures? who is the bald headed man?? I can’t even start to solve these until I get this blown up a little better. 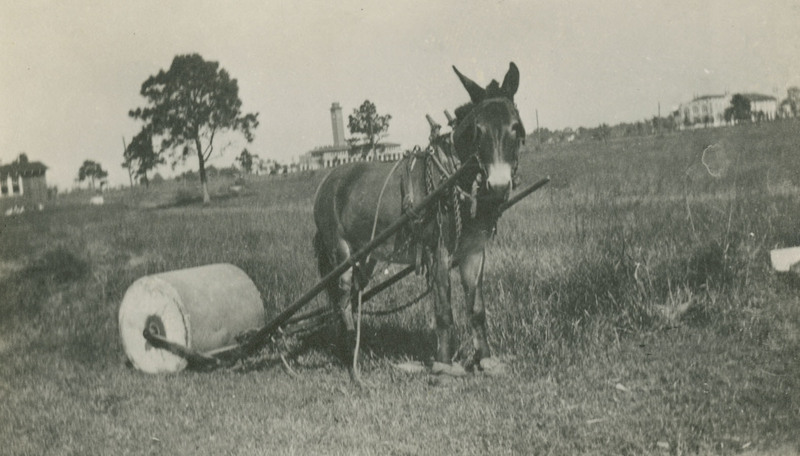 I’d put this picture very early 1960s–roughly forty years after the mule was photographed. That was a really busy forty years. The bald man is Robert Gilruth, the first head of the Manned Spacecraft Center (now Johnson Space Center). The rocket is an Atlas booster, which launched the last four Mercury missions into orbit. From the look of the pillars in the background it could be the Albert Thomas convention center. The mule picture helps me realize how odd Rice must have appeared in its early years. The tall mech lab chimney and some fancy Italianate buildings seemingly plopped down on a barren swampy landscape.